When to Break the Rules - Welcome Authors! 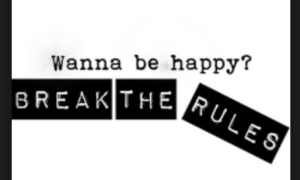 Where have you been following the rules – in life or in business – even though there’s a part of you that knows it’s not good for you? 2. Some highly respected authority tells you, you should? For me, 2016 has been a year of rule breaking. Of shedding the yoke of indoctrination and walking away from “proven” systems that I’m told will lead me to my pot of gold. See, the rules I was following made me feel like I was standing on a street corner, wearing a chicken suit, hawking my wares. To me, this whole internet marketing thing feels like it’s one big Kmart Blue Light Special. That’s how I’ve felt for a while now, especially when I’ve followed what the “experts” say I should do. So instead, I’ve removed the shackles, turned within, and discovered what really lights me up and feels authentic and I’m building my business/life from THAT place instead. Now, don’t get me wrong – from time to time we need expert advice for things we actually don’t know how to do – but then we must take the crucial step of making sure those steps feel in alignment with who we are. Otherwise you’re just wearing the chicken suit. If you feel you’re working way too hard following all the rules and you still can’t find your pot of gold, then rest assured there’s a MUCH EASIER way to go about building your life/business. Let’s get you firing on ALL pistons, so that you not only survive the fickle tides of the marketplace, but you also create the sacred business & life that you deserve. Tired of chasing success & satisfaction? Not sure what you’re doing wrong? The Something’s Missing Quiz will reveal exactly why you may be feeling frustrated or bitter about your business/life.Answer a few brief questions to find out where you’re off/what’s wrong, and then receive a customized First Aid Kit that will help you tweak a few things to create more satisfaction and success.